So, off I go to explore our first brewed offering on this forum. Since I was never one to want to start small, I figured, why not go for the gusto from the very start? Not that I am prejudiced against light-bodied beers, because in truth I am not. Quite often we need those lighter entrants to refresh and sustain us during those long conversations or multiple-match darts games, or whatever your extended pursuit may happen to be. But this time of year, as the temperature drops to freezing, the days shorten to a literal shadow of what they were in June, and the bells of Yuletide come a 'ringin', we often turn our thirsts to something bold and substantial - something to warm the very cockles of our heart. 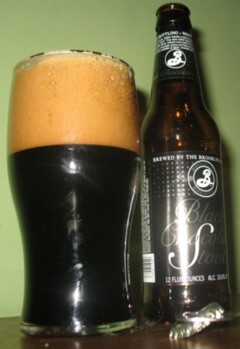 Enter the Brooklyn Brewery and their celebrated winter seasonal, Black Chocolate Stout. BLACK CHOCOLATE STOUT FROM BROOKLYN BREWERY. I had the distinct pleasure of sampling some Black Chocolate Stout recently while having dinner with my family in Porters' Pub in Easton, Pennsylvania. Easton has been a town that has been struggling to remake itself for quite some time. Although it had been making steady progress for years, it was somewhat sabotaged by the recent recession that has caused so much trouble for all but a very lucky few of us. But Easton still has some gems that continue to flourish, and Porters' is without a doubt one of these. On a Saturday evening you are still hard pressed to find a table without prior reservations, so it seems that the tavern's loyal following has made it somewhat recession-proof. On this particular evening I was looking to pair something hearty and full bodied to match the full rack of delicious baby back ribs and potato salad the pub offered on special that evening. The Black Chocolate Stout was available on draught and was served in pints - pints, mind you - keeping in mind the fact that the brew clocks in at slightly over 10 percent alcohol by volume. This beer is for savoring, not chugging contests that might leave the participants rolling under the table after several go-arounds. But to those who consume it responsibly, Black Chocolate Stout is a treat that might bring back memories of childhood chocolate fudge cake, minus the booze, of course. It has an immense chocolate-like roasted malt character that hits you square in the palate on the first sip, followed by some earthy hop character and a distinct alcoholic warmth. Despite its strength, the stout is surprisingly “moreish” - a beer drinker's term that describes how a brew's flavor can beg for more from sip to sip. Because it is so well balanced, Black Chocolate Stout thus manages to avoid being overly sweet or cloying. Hah! No wonder the good folks at Porters' see fit to serve the heady brew in pints. But if you are driving that evening, beware, beware! The Brooklyn Brewery, brewers of an impressive line of award-winning beers, likes to call its Black Chocolate Stout an “imperial stout”, a strong style originally brewed in England for the pleasure of the Russian czars (especially Catherine the Great, I am told). Although available on draft, the beer is also available in a bottled version that the brewery advises will keep well and will actually improve in quality if aged over time. The brewery also boasts that Black Chocolate Stout goes well with various cheeses (especially Stilton), cheesecakes, chocolate desserts, and ice cream. I might add to that through personal experience that it makes a great chocolate float with vanilla ice cream. Brooklyn's Garrett Oliver might well be one of this country's first African-American brewmasters but by no means does his distinctiveness stop there. He is acclaimed as an authority on the brewing of traditional beer styles. He has been brewing at Brooklyn since 1994 and has since added to his resume with several books on the subject, as well as multiple awards for his keen knowledge on brewing and his unique ability to pair beers with foods. 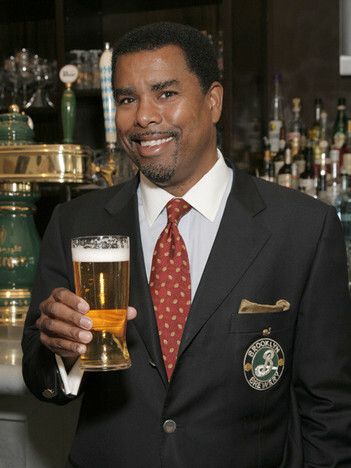 He has also hosted numerous beer tastings, and has made countless television appearances on the subject of great brew. It appears that no matter how you slice it, black is beautiful!! To my readers and friends at American Public House Review, I wish you all a most merry and joyous Holiday season and a most happy and prosperous New Year. Glenn P. Beck was born in 1962 and raised in Livingston, New Jersey. He graduated from Seton Hall University in 1986 with a B.A. in Communication. Glenn was previously the owner and operator of the Hunterdon Homebrew Shoppe in Frenchtown, New Jersey. While there, he taught an adult education course in the fundamentals of homebrewing beer. 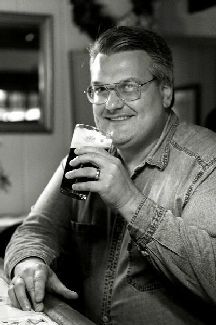 He won a blindly judged national homebrewing competition (Memphis 1995) in the German Ale category with a delectable altbeir that he created. Our resident beer meister was also hired as an accounts representative with the River Horse Brewing Company in Lambertville, New Jersey from 1997 to 1999. Glenn is a passionate scholar of the brewer's art. He has extensive knowledge as to the history, lore, brewing techniques, ingredients, and last but not least, the enjoyment of beer. He currently resides in Bloomsbury, New Jersey with his wife Nancy and their faithful malamute, Sam.